Tesla owners continue to get all the goodies. In this case, Insteon. 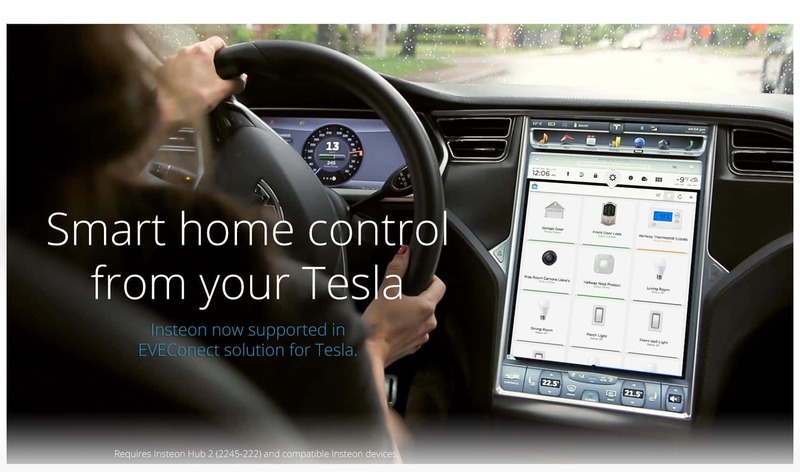 This week the company announced its smart home devices can now be controlled directly from the Tesla S and X touchscreen interface. To do so, you’ll need an app called EVEConnect (Version 2). There’s a free edition as well as paid ones that offer more features. In addition to Insteon, the app supports a comprehensive number of devices and companies including many us smart home enthusiasts are quite familiar with already: IFTTT, Nest, Wink, Samsung SmartThings, and Bosch Home-Connect. Thanks to Tesla’s large touchscreen, the interface looks quite impressive — at least from what I can tell from photos. Sadly I drive a lowly Prius and can’t test this feature! 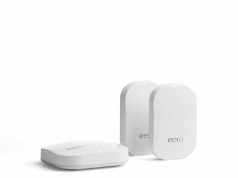 As you’d expect, with EVEConnect you can turn lights on and off, check various sensors (like leak and motion detectors for instance), unlock doors, and set the temperature on a thermostat. Pretty cool stuff. Of course, you could do all of this using the respective apps on your smartphone. But what’s nice about this approach is you get an integrated all-in-one dashboard (literally) view. So you don’t need to go into Insteon to turn on the porch light and the switch to the Nest app to turn on the heat. You just do it all in one place. 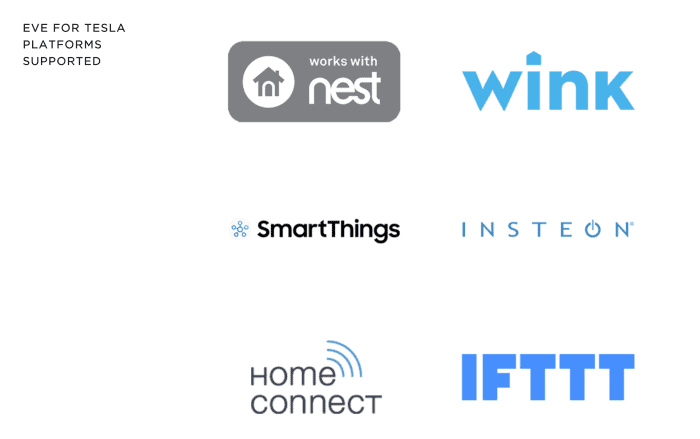 Samsung SmartThings does something similar (though not on the Tesla) in that you can assimilate various devices into one common dashboard. I use it, for example, to check on various sensors and also to make sure the garage door is closed at night. 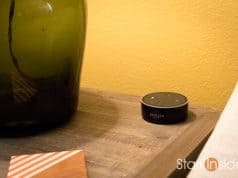 Also, with smart speakers we’re seeing a similar battle for control of our homes. 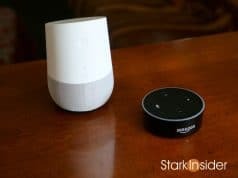 Google Home and Amazon Echo speakers offer smart home capabilities that also integrate with a variety of manufacturers. Again, the idea is simplicity. Just use your voice. “Hey Google, turn on the TV” or “Alexa, turn on the kitchen lights”. 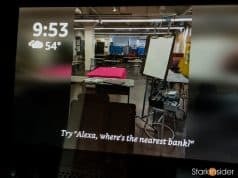 It’s this simplicity I think that is really turning loose the market for the mainstream smart home — not the gadgety one of the past that required workable knowledge in C and programming IF/THEN statements. The user friendly house has finally arrived. And so has the user friendly car. 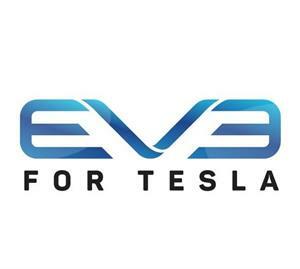 As in Tesla. 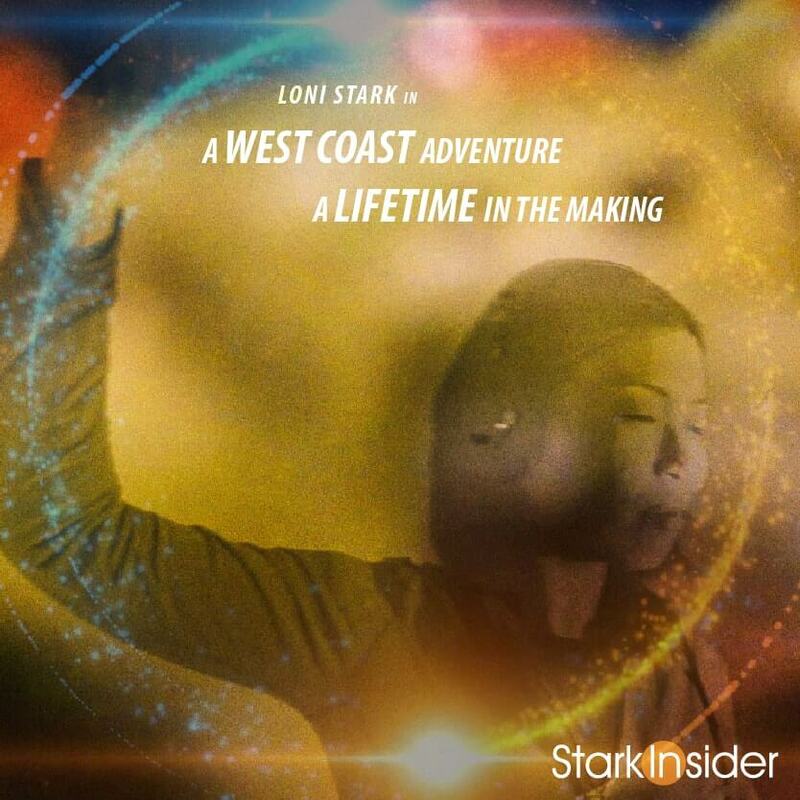 If you have Insteon devices (which I’ve written about in the past here on Stark Insider and strongly recommend) then you should give the EVEConnect a literal spin. Meantime, don’t expect Google and Apple to be content with just Android Auto and CarPlay. 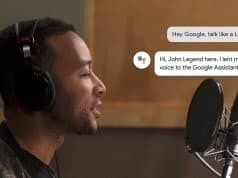 Look for voice via Google Assistant and Apple Siri to also battle it out for control of your music, A/C, and navigation. Hands-free control? Makes perfect sense while driving.